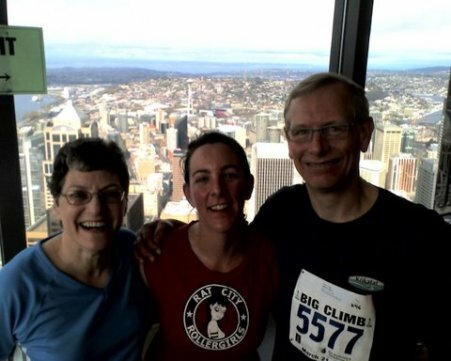 Until participating in the Big Climb race up the stairs of the Columbia Center in downtown Seattle, I had no sense of just how pampered road runners can be. 1. The option to train on courses similar to the race course. 2. The option to warm up thoroughly right before the race. 3. The option to pass slower runners without altering your stride or announcing your approach. 4. The option to keep an eye on the people you most want to beat, and to draw inspiration from their proximity. 5. The option to know immediately, upon finishing the race, whether you beat those people. As I found out, these generally are NOT options for stair races such as the Big Climb. Liz and I did manage to exercise option #1, but only because of a chance email exchange with PJ Glassey, who let us join his Saturday morning practice sessions at the 63-story municipal building across the street from the Columbia Center. Otherwise we’d have been stuck preparing for the 1,311-step Big Climb on outdoor stairways of 200-300 steps with landings, turns, and handrails very different from those in the Columbia Center. The other options listed above are rendered impractical by the logistics of sending thousands of people up a 43-inch-wide stairwell. People line up 15 minutes ahead of their scheduled start time, twitch nervously while standing in place, and then are sent into the stairwell at five-second intervals. Passing and/or getting passed are frequent occurrences except for the lucky few at the very beginning of this vertical parade. As I lingered at the top of the Columbia Center and some of my teammates arrived, my tension dissipated. Yes, I was part of a team — a very nice one, in fact, irrespective of my focus on the pursuit of individual glory. And we, the “PATH To Victory” team, consisting of employees and friends of PATH, were doing the Big Climb in memory of Steve Rider, who died of complications of leukemia last June. I myself never met Steve. But he was younger than me when he died, and he was the brother of a former PATH employee, and the Big Climb exists to help people like him and families like his. And so it was a good lesson to be slowed down by a bunch of middle-school kids and then to be reminded of where this ranks in the grand list of life’s hardships. Below are a couple of pictures of some of my PATH To Victory teammates: Dave Oxley and Melissa Valdez in the top photo, and Janet Vail, Shannon Mills, and Doug Palm in the bottom one. Thanks to them and the others (Christine Brooks, Grant Kidd, Deborah Phillips, and Paul Sivesind) for welcoming Liz and me onto the team. Greg — You are a true champion: brave enough to try new things like stairclimbing and wise enough to see that the goal is really to help others. And you are no slouch either — your time of 7:54 beat my time of 7:55 last year and I had none of the impediments you refer to. 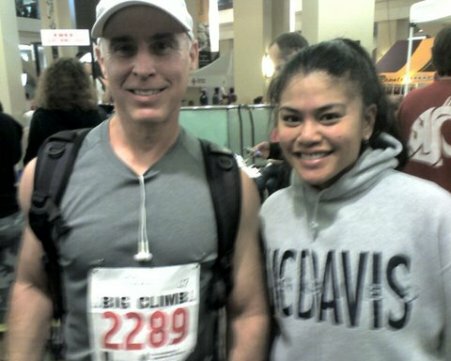 I hope you return next year to do the stairclimb again, without interference. Roadrunners have it made, but I will stay with ultra's. I will do a stair race sometime. As a middle school teacher, Brinsley got a laugh out of the image of you trying to pass a bunch of oblivious middle schoolers in a narrow stairwell. Congrats on a great run at the climb Greg! It's interesting to hear about the new challenges you faced in this new undertaking (particularly the idea of not knowing who you're racing/how you're doing, or even knowing how you did when you finish! ), and awesome that you tackled the challenge so handily! We missed seeing you at Chuckanut, but congrats on a great climb, and see you back on the road/trail soon! Greg — Thank you for joining our team and for leading PATH to Victory! Our team could not have accomplished the 4th place finish without the help of you and Liz. We hope you will consider joining our team again next year. Good luck in the Mad City 100K in Madison in April!